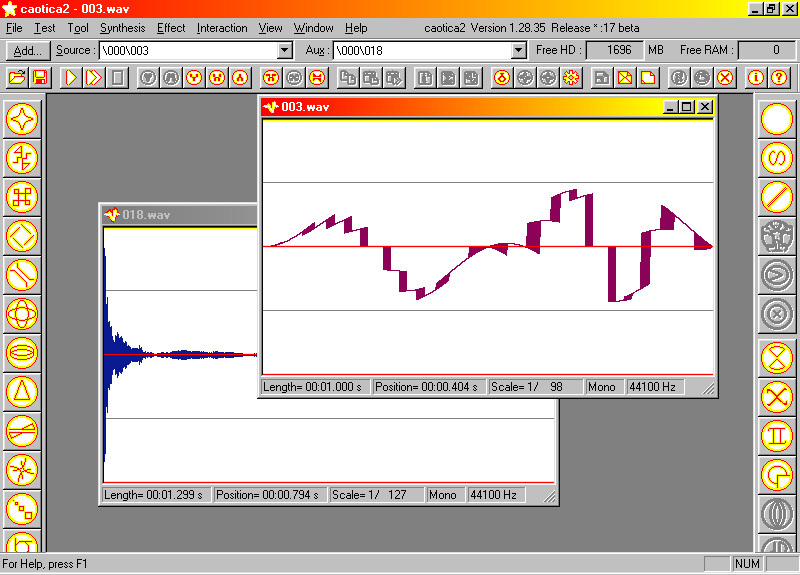 caotica2 is an audio program featuring synthesis and effect tools. The goal of this experimentally designed application is to generate new sounds and noises, and also to alterate wave files using simple and complex mathematical effects. The results may sound "noisy" and chaotic and, actually, they are, although rather predictible when getting used to the application. caotica2 is to be a source of «rough sound material» for the use of experimental composers. caotica2 allows you to have 2 active files at a time. The first is called "source" and the second "auxiliary". some effects (called "interactions") allow you to control the modulation of a sound using another one. when you create a new sound, modify an existing one or pull a window to the foreground, it is immediately considered as source and the previous source as auxiliary. you must then refer to the comboboxes under the menubar to know on which sounds you are working. you can use these comboboxes to control directly the source and auxiliary files. Remarks: as there is no tool to build compositions in caotica2, it seems necessary to have another sound application to perform recordings, mixings and sequencing, for caotica2 has been developed only to dig sound out from the infinite diversity of chaos. New in this version: Features many improvements and new additions. Posted by Andersen on Sun, 10/06/2002 - 20:28. Is there CAOTICA2 r18 forMacintosh?